Madhya Pradesh is one of the few states in India which are popular for their ancient culture, and historic sites. Being one of the oldest-living states, Madhya Pradesh houses innumerable places of interest which have been alluring tourists and travellers in millions every year from all over the world. Mandu is certainly one of these ancient sites in the state which remain crowded with tourists, especially history and architecture lovers, throughout the year. Located in the Dhar district, Mandu is popular amongst tourists for its architectural wonders which you can find in each and every corner of the town. It is a perfect amalgamation of history and architecture. Hence, you must take a break from your busy life and plan a trip from Bhopal to Mandu to learn about Medieval India and its glory. Located in the Malwa region of Madhya Pradesh, Mandu experiences an extreme type of climate and hence, the summers are hot here. Therefore, if you are looking forward to explore the beautiful architecture of Mandu, then the best time is from October to the end of March. However, it remains a favourite tourist spot for history lovers throughout the year. By Air: It is one of the best ways to reach Mandu within minimum time. You can take a direct flight from Bhopal to Indore and then from there you can hire a taxi to Mandu. Indore is located at a distance of about 95 km from Mandu. By Rail: The nearest major railway station from Mandu is located in Indore and hence, from Bhopal you can catch a direct train to Indore. Once you have reached the station, you can hire a taxi to Mandu. By Road: It is the preferable mode of transport as Mandu is easily accessible by road, being located at a distance of about 290 km from Bhopal. You must take route 1 if you desire to reach your destination within minimum time. Moreover, you can also take a break at Dewas and Indore and explore their beautiful surroundings. Through route 1, you can reach Mandu within 5 h, i.e, 2 h lesser in comparison to route 2. Dewas is located at a distance of about 155 km from Bhopal and 135 km from Mandu and hence, it is the right spot to take a break. Dewas is one of the major industrial centres in the state and is also known for its ancient temples and other natural sites. The prominent places to visit here include Kavadia Hills, Chamundi Devi Temple, Kaila Devi Temple, Kheoni Wildlife Sanctuary, Pushpgiri Tirth, Gidya Khoh Waterfall and Meetha Talab. Another beautiful city on your way to Mandu from Bhopal, Indore is one of the advanced cities in Madhya Pradesh and is also known for its historical places and natural surroundings. Being one of the smart cities in India, it is gaining popularity day by day. You must take a break at Indore on account of its intact natural as well as historical beauty. The major places here include Rajwada Palace, Atal Bihari Vajpayee Regional Park and Patalpani Waterfall. Indore is located at a distance of about 95 km from Mandu and 195 km from Bhopal. Mandu is famous amongst tourists as a historic city which has been in existence since the advent of the Common Era. However, most of the historical places and architectural wonders found within its boundaries date back to Medieval India. It has been ruled by several dynasties including the Sultanate of Delhi, the Mughals, the Malwa kings and the British. Hence, the region in and around Mandu boasts of its rich history and culture. Following are the places which you must visit while in Mandu. Settled in the midst of two lakes, Jahaz Mahal is the prime attraction in Mandu and hence, it should not be missed by any traveller or tourist even by mistake. 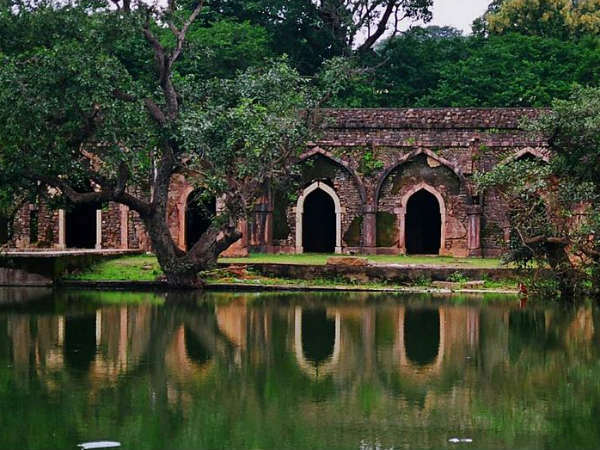 It was built by Ghiyas-ud-din-Khilji and was a significant place of recreation for the king. As it appears like a floating ship amid waters, it is named Jahaz Mahal. With grand courtyards and monumental architecture, Jami Masjid is one of its kind in India and was inspired by the Great Mosque at Damascus. One cannot merely forget to visit such an amazing splendour of Mandu which clearly showcases the fine work of architecture. You can also find a 18th-century Hindu temple dedicated to Lord Rama in its vicinity and the ruins of Asharfi Palace located in front of the mosque. Another popular historic site in Mandu, Hoshang Shah's Tomb is one of the finest marble works in the state. Embellished with intricate patterns and adorned with beautiful towers and courts, Hoshang Shah's Tomb is also believed to be the inspiration for building Taj Mahal. It is the said to be the palace of Rani Roopmati, who was the love interest of Baz Bahadur, the then ruler of the region. It has also served as an army observation post in the past. Built out of sandstone, it is one of the most visited places in Mandu today. Apart from all the above-given places you can also visit Rewa Kund, Baz Bahadur's Palace, Hindola Mahal, Nilkanth Palace and Mandu Fort and explore their architectural beauty and historical significance.